The prosperity of the majority of Greek city-states was based on agriculture and the ability to produce the necessary surplus. 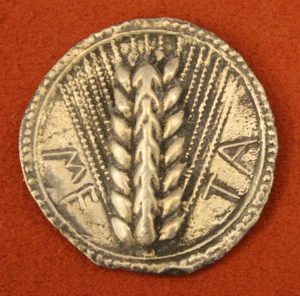 The prosperity of the majority of Greek city-states was based on agriculture and the ability to produce the necessary surplus which allowed some citizens to pursue other trades and pastimes and to create a quantity of exported goods so that they could be exchanged for necessities the community lacked. Cereals, olives, and wine were the three most produced foodstuffs suited as they are to the Mediterranean climate. With the process of Greek colonization in such places as Asia Minor and Magna Graecia Greek agricultural practice and products spread around the Mediterranean. The state did not control farming and crops were grown and livestock reared by private individuals on their own land. Indeed, the widespread practice of not permitting non-residents to own land meant that smallholdings were the norm. Another important factor which limited the amalgamation of land plots over time was that male children generally inherited equal shares of their parents’ land. Farms at Athens ranged in size from 5 ha (the poorer citizens) to 5-10 ha (middle class) and 20 ha (the aristocracy). In Sparta farms were a little bigger on average, ranging from 18 ha for the smaller ones to 44 ha for those belonging to the richest citizens. The poorest citizens had no land at all and so, if they had no other skills of benefit to the community such as crafts, would have worked on the land of others for pay or leased land to work it themselves. It is not clear if farmers always lived on their farms or resided in the city and travelled each day. It seems reasonable to suppose there was a mixture of both approaches which was probably dependent on the location of the land inherited by an individual (i.e. the proximity to the city and separation from other plots they owned) and their personal status such as being able to afford slaves (or helots in the case of Sparta) to work the land. The crops produced by the ancient Greeks were, of course, selected for their suitability to the Mediterranean climate. This has a combination of dry hot summers with mild winters providing plentiful rainfall. The irregularity of annual rainfall did mean that crop failure was a regular problem, though. Wheat crops may have failed once every four years and barley crops once every ten years because of insufficient water supply. Terrain, localised weather conditions, and different soils were also factors in making some areas more fertile than others. Indeed, as a whole, only one-fifth of Greece has arable land so pressure to make best use of it was high. The most widely cultivated crop was wheat – especially emmer (triticum dicoccum) and durum (triticum durum) – and hulled barley (hordeum vulgare). Millet was grown in areas with greater rainfall. Gruel from barley and barley-cakes were more common than bread made from wheat. Pulses were grown such as broad beans, chickpeas, and lentils. Vines to make wine and olives to produce oil completed the four main types of crops in the Greek world. Fruit (e.g. figs, apples, pears, pomegranates, quinces, and medlars), vegetables (e.g. cucumbers, onions, garlic, and salads) and nuts (e.g. almonds and walnuts) were grown by many private households. Ploughing and sowing was carried out in October-November-December. It is interesting to note that there were no distracting religious festivals or records of Assembly meetings in Athens during this crucial and busy period. Vines were pruned back in the early spring, and grain harvested in May-June. Winnowing, threshing, and storage were done in June-July while grapes were gathered and made into wine and figs collected in September. 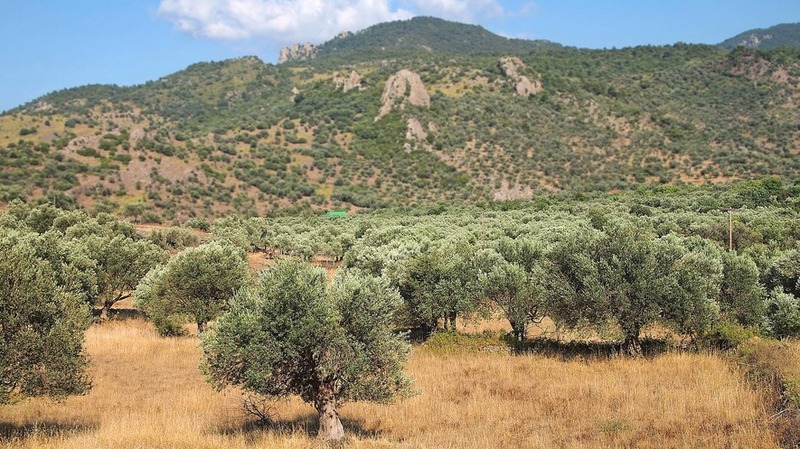 In the autumn olives were harvested and pressed into oil. During the winter some hardier crops were sown and fields maintained. There is evidence of crop rotation, and fields were left fallow to allow soil nutrients to regenerate and moisture to build up. In more pressing times some fields would have been used continuously throughout the year or planted with multiple crops at the same time. Such crops as beans and lentils were also grown and reploughed back into the field to re-fertilise it or weeds could be left to grow as food for grazing animals. Small plots used for growing fruit and vegetables would have been irrigated with small water channels and cisterns. Trenches, if labour were available, were dug around trees to hold precious rainwater for where it was most needed. 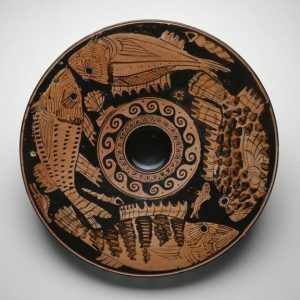 Equipment used in Greek agriculture was basic with digging, weeding, and multiple ploughing done by hand using wooden or iron-tipped ploughs, mattocks, and hoes (there were no spades). Richer farmers had oxen to help plough their fields. Sickles were used to harvest crops, which were then winnowed using a flat shovel and baskets. Grains were then threshed on a stone floor which was trampled on by livestock (and which might also have dragged sledges for the purpose too). Grapes were crushed underfoot in vats while olives were crushed in stone presses. 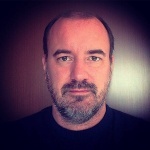 The ancient Greeks did not manage large herds of livestock for the purposes of creating a saleable surplus and specialised pastoralism, with its necessity to seasonally move animals between pastures in different climate zones (transhumance), is not recorded until the Classical period in Greece. However, many private households would have kept a small number of animals, perhaps no more than 50 in a herd would have been the norm. These included sheep, goats, pigs, chickens, and some cattle. They were useful for their meat, milk to make cheese (it was rarely drunk), eggs, wool or leather, and to fertilise crops. Animals were reared in greater numbers where the local terrain was not suitable for agriculture. These animals, besides having access to naturally occurring areas of grazing, were fed fodder of chaff and straw, stalks of vegetable plants, fallen and damaged fruit, and the residues of grapes and olives after pressing. Horses, mules, and donkeys were also reared for transport. Most farmers would have only produced sufficient foodstuffs for their own family’s needs but they would have bartered surplus produce for everyday necessities and foodstuffs they did not produce themselves such as cheese, honey, fish, and shellfish. Some of the wealthier citizens with larger plots did certainly produce cash crops which they could sell in bulk at markets. Agricultural products traded within Greece between citizens at markets and different cities included cereals, wine, olives, figs, pulses, eels, cheese, honey, and meat (especially from sheep and goats). From the 5th century BCE, Athens’ port of Piraeus became the most important trading centre in the Mediterranean and gained a reputation as the place to find any type of goods on the market. Greek merchant ships plied the Mediterranean and exported goods to such places as Egypt, Magna Graecia, and Asia Minor. Foodstuff exports included wine, especially from Aegean islands like Mende and Kos, olives and olive oil (transported, like wine, in amphorae). By-products such as hides were exported too, especially from Euboea. Many Greek city-states continued to function as important trade centres throughout the Hellenistic and Roman periods, especially the free-trade ports of Athens, Delos, and Rhodes. The involvement of the state in trade and the sale of agricultural products was relatively limited; however, a notable exception was grain, imported from Egypt and the Black Sea area, to ensure that in times of drought populations did not starve. 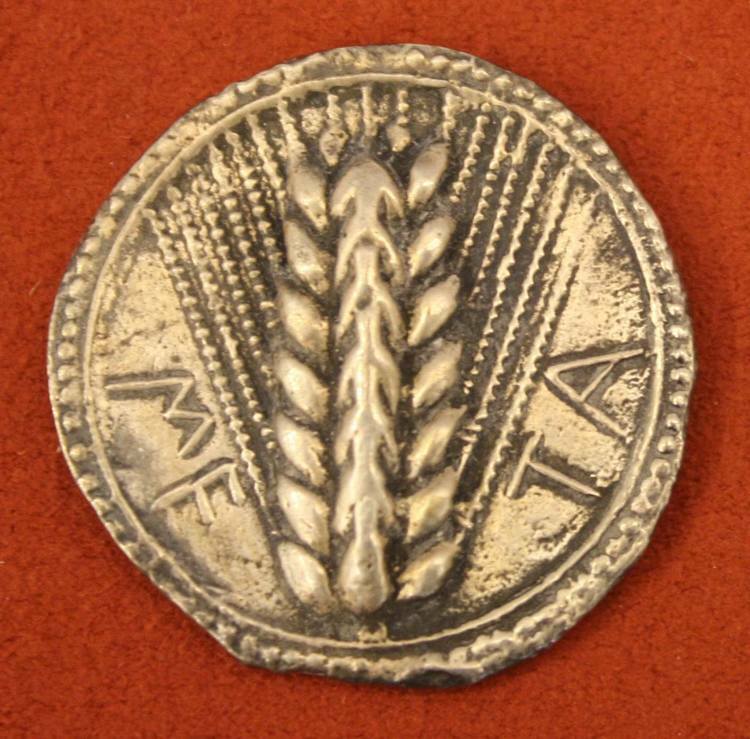 For example, so vital was it to feed Athens’ large population that trade in wheat was controlled and purchased by a special ‘grain buyer’ (sitones). From c. 470 BCE the obstruction of the import of grain was prohibited, as was the re-exportation of it; for offenders the punishment was the death penalty. 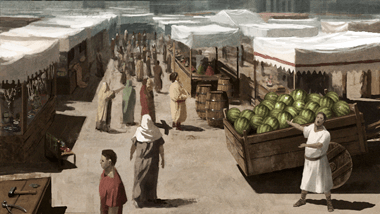 Market officials (agoranomoi) ensured the quality of goods on sale in the markets and grain had its own supervisors, the sitophylakes, who regulated that prices and quantities were correct. Although city-states did often impose taxes on the movement of goods and levies on imports and exports at ports, there were also measures taken to protect internal trade and more heavily tax goods which were destined for, or came in from, areas outside Greece. There were also trade incentives such as on Thasos to encourage the export of their high-quality wine. This entry was posted in Agriculture, Ancient, Food, Greece, Greek, History. Bookmark the permalink.